The birth of Jesus is the foundation of a Christians faith. I can’t tell you how many times my kids have heard the birth of Jesus story. It is one of the most popular and most important Bible stories. We’ve also taught the kids in kids church about the birth of Jesus multiple times. One thing we’ve really struggled with during kids church was finding the birth of Jesus activities. The children’s ministry director at our church does a great job of providing us with the Bible curriculum to teach the kids. 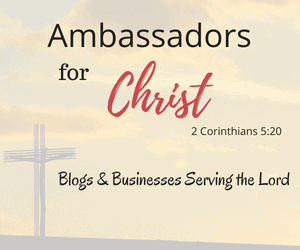 The curriculum includes the story from the Bible, Bible verses, and suggestions for activities. However, we have personally found that the activities suggested aren’t always as fun as the activities we can find on the internet. 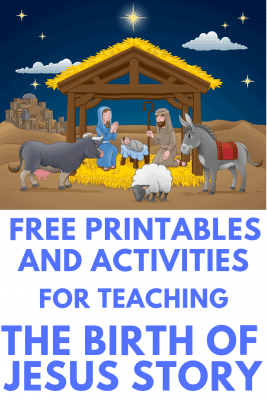 Because of this, I decided to share our favorite resources for the birth of Jesus story for kids. This post will feature all the resources available in one place so you don’t have to spend hours looking for them. It will also serve as a resource for us when we are teaching the birth of Jesus story to children’s church again. The majority of the resources on this post will be free. Sometimes I do order items online that I really love to teach children’s church so I may list some of those items as well. Our church services are an hour and a half. So I will give you an example based on that time frame. 8:30 – Kids come in and play with puzzles, Legos and other toys. 9:00 – We sing a few songs for worship, pray and get into our lesson. 9:20 – We watch a short video depending on what activities we have chosen. 9:30 – We give them a snack while they complete an activity and/or craft. 9:50 – Clean up and get the kids ready for their parents to pick them up. 10:00 – Parents pick up kids. If you don’t have a Bible curriculum to follow to tell the birth of Jesus story, you can read it directly from Luke 2:1-20. While I love studying directly from the Bible, I also love using Bible story books to teach kids. Teaching the Bible to kids is fun and rewarding. It can be hard to keep the child’s attention for a long period of time (we teach kids ages 4-6) so we include a craft and/or an activity during our lesson time. Plus! Kids love bringing things homes to mom and dad. 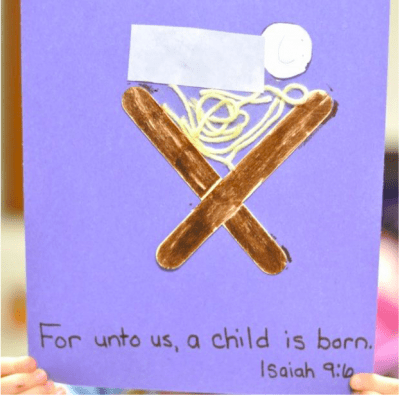 Here are some of our favorite birth of Jesus activities for kids that are free. You may need to purchase items to complete the activities. Sometimes our church will have the supplies. If they don’t we will go to our local Dollar Store to get our supplies. It keeps the cost really low. This is a really cute birth of Jesus activity book. There are some other fun activities for this study available as well. 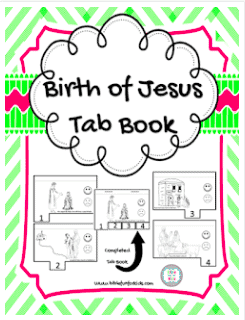 Click this Birth of Jesus Tab Book link to get your free download. This is a simple mini book. Just cut and staple. The story features Bible characters such as Mary, Joseph, angels, shepherds, wise men, and Baby Jesus. You will have to register on this website but it’s completely free and so is the download. Click this A King is Born Mini Book link to get your free download. This birth of Jesus word search is based on Luke 2:1-20. You’d have to decide if this activity would work with your specific age group. It definitely requires reading and writing skills. Click this Birth of Jesus word search link to get your free download. This is a Bible quiz on the birth of Jesus. This is another one that requires reading and writing skills. 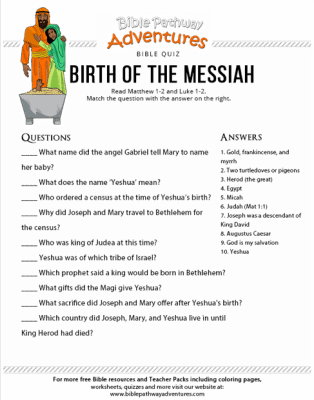 Click this Birth of the Messiah Bible Quiz link to get your free download. 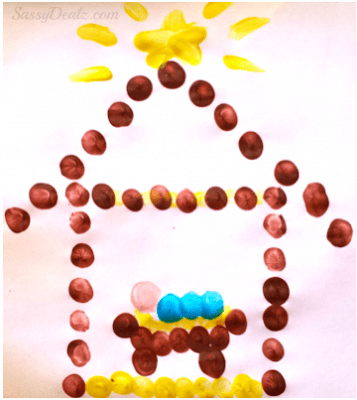 This is an activity for retelling the story of Jesus’ birth. You can turn it into a craft by using the black and white version as color and paste activity after playing the game. You can also create craft stick puppets for retelling. You will have to register on this website but it’s completely free and so is the download. 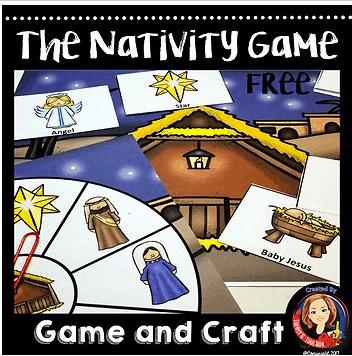 Click this Nativity Game link to get your free download. 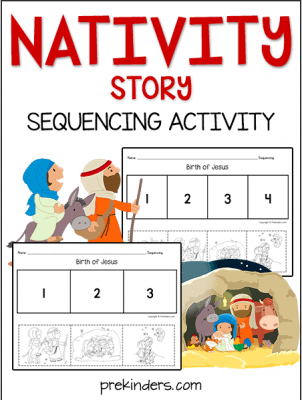 This activity helps kids understand the sequencing of events in the birth of Jesus. You may need to cut the pieces apart if the kids are too young. Click this Nativity Story link to get your free download. These are activity pages for retelling the story of Jesus’ birth. This one is for kids from 3rd grade and up. You will have to register on this website but it’s completely free and so is the download. 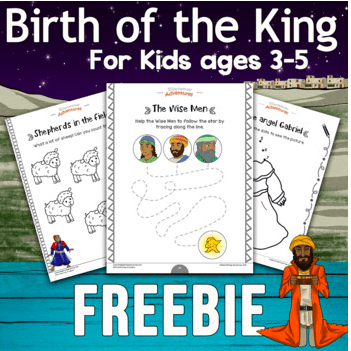 Click this Birth of the King Activity link to get your free download. 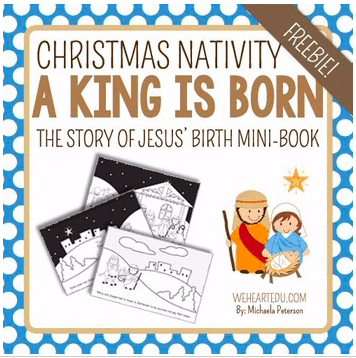 This activity set has different activities from the story of Jesus’ birth. This one is for the younger You will have to register on this website but it’s completely free and so is the download. 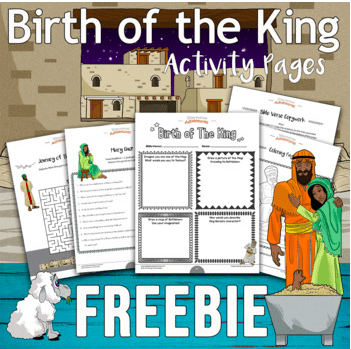 Click this Birth of the King Activity link to get your free download. 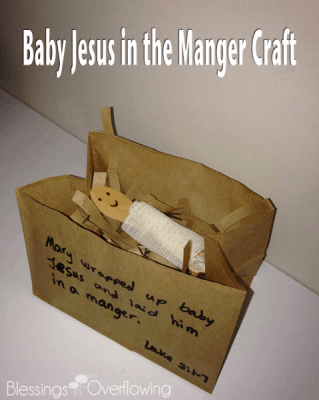 These birth of Jesus crafts are on the simpler side. We enjoy making crafts with the kids but they can be time consuming and messy. If you do an activity and a craft you may be short on time. Make sure to choose your activities and crafts based on the time available. I’m listing a couple of our favorite YouTube videos here. Please use caution on YouTube. The videos are not always appropriate or Biblically correct. We love VeggieTales and we will often show one of those videos depending on our time frame. The best VeggieTales episodes for the Birth of Jesus is The Little Drummer Boy. Hopefully, this resource has been helpful to you. I will continue to add to this post as I find new things. I’d love to hear if you have any suggestions for this post. Feel free to contact me or leave me a comment below with your suggestion.